Apple will be launching a 5.8-inch and 6.5-inch models with OLED displays and a lower-priced 6.1-inch model with an LCD display in 2018. Now According to a new report, 6.1-inch iPhone model with LCD display is said to come in two variants. One that packs single SIM and another with dual-SIM dual standby (DSDS) functionality. Securities analyst Ming-Chi Kuo further stated that the dual-SIM iPhone could be priced at $650 to $750, while the single SIM model could potentially be less expensive at $550 to $650. However, he didn’t mention the pricing of the two OLED iPhones that will be launched alongside the 6.1-inch model, but we’re pretty sure they would be on the more expensive side. Apple will use Intel’s XMM 7560 and Qualcomm’s Snapdragon X20 modems for faster LTE speeds and both the DSDS devices will support LTE+LTE connections. The production of the 6.1-inch LCD iPhone will start three to five weeks after the two OLED models because of the inclusion of DSDS model. 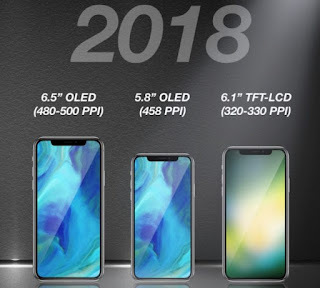 It also believed that the 6.1-inch LCD model could account for 65 to 75% of total iPhone shipments from 3Q 2018 to 3Q 2019. Securities analyst Ming-Chi Kuo in his research note stated: 6.1″ LCD iPhone may have model that supports DSDS. If the 6.1″ LCD iPhone comes with DSDS and single-SIM models, we believe it will result in two benefits: (1) more price segments would be created, significantly boosting shipments via the low-price single-SIM model. For instance, if the DSDS model sells for US$650-750, the single-SIM model may sell for US$550-650; and (2) the DSDS model will help increase market share in China and commercial markets.